If you have never been to NoiseTrade.com, now would be a good time to visit them. Noise Trade has free music. Yeah sure, there is the option of leaving the artist a tip, but sometimes I don't really know the artist that well. There have been a couple of times that I have left a tip for an artist that I knew and I believed in supporting their work (or ministry in some cases). But sometimes I just download something that sounds interesting, but I have never heard of it before. 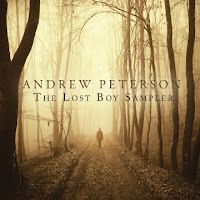 If you haven't been there before, you should swing by and pick up Andrew Peterson's The Lost Boy Sampler. So far I have loved all of Andrew Peterson's work, and this one doesn't seem to be a disappointment. I also downloaded two albums from The Vespers. I have never heard of this group, but so far I have really enjoyed what I've heard so far. In fact, I am listening to them right now. Here is a video of them live in New York.